Shoe Girls Cards: Easter Chick? Nothing says Spring more to me than Easter. 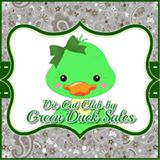 I love these darling Green Duck Embellishments. They make cards super quick to put together when I need a fast card. I used the super cute Chick and popped him on dimensionals. Cut an egg shape out of white CS and popped that on dimensionals over the blue DP. The blue DP is a shimmer paper that I have had for 20 years. I figure it was about time I started using some of it. LOL! These darling images are from Green Duck Sales. They have a great fan club program that you can check out: www.diecutclub.com or you can follow them at www.facebook.com/DieCutClub. This blog is a personal blog written and edited by me, Lisa Swarm. All opinions expressed are mine alone. If you have questions, comments or concerns please feel free to contact me at: jnsljs@yahoo.com, anytime. This blog is my personal outlet to share my creations with the crafting community. Posts on this blog may contain affiliate links. I do not make commissions on any of these links and any purchase you make is of your own volition. Thank you for stopping by my craft corner.